I showed you these not long ago, and now they're done! Quite a fun project really. 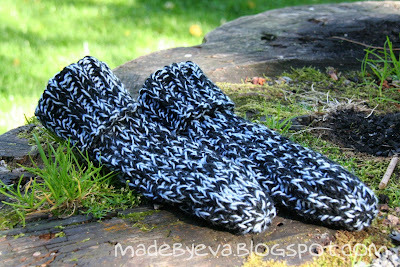 The DROPS pattern is simple enough, just a 2x2 rib that spirals down the main part of the sock. They are tube socks, which not only make them a quick knit, but also brings a couple of other advantages. Without a fixed heel position, they will fit as long as the socks are long enough to reach over his ankles. The straight ribbing on the top, which is folded down in the picture, can be unfolded for extra length. Also, as the position of the feet in the socks will change every time they're worn, the wear and tear is distributed over the whole sock, not concentrated on just a few exposed points. The ribbing makes them stretchy in the width direction, so they expand with the feet as they grow. It's difficult to see in the picture, but I made the two socks spiral in opposite directions. Just something I had to do, me being me. ;) More details on my Ravelry page, or follow this link directly to the pattern.